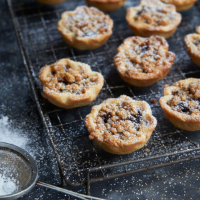 For a twist on a classic, these mince pies are topped with a light, crunchy crumble that’s packed with festive flavour. Get well ahead and make a batch to pop in your freezer now, so they are ready to warm through on demand during the hectic Christmas period. 1. For the pastry, put the fl our, almonds, caster sugar, butter and vanilla seeds in a food processor and whizz to form crumbs. Add the egg yolk and 1 tbsp cold water. Pulse until it comes together to a dough, adding a drop more water if needed. Turn onto your worktop and gently knead until smooth. Wrap in cling fi lm and chill for about 30 minutes. 2. Before you wash the food processor, make the crumble topping. Briefl y pulse together the fl our, demerara sugar, butter, orange zest and mixed spice to a chunky crumble mixture, then set aside. 3. Preheat the oven to 200°C, gas mark 6. Roll out the chilled pastry to the thickness of a £1 coin on a lightly fl oured surface and cut out 24 rounds using an 8-9cm pastry cutter, re-rolling any trimmings. Press the rounds into the holes of 2 x 12-hole bun tins and lightly pinch the edges with your fi ngers for a fl uted effect. 4. Divide the mincemeat between the cases (about 1 heaped tbsp in each) and scatter the crumble over the tops. Bake for 15 minutes, or until golden and crunchy. 5. Leave to cool in the tin for a few minutes before transferring to a wire rack. Once cooled, dust with icing sugar to serve, if liked, or freeze for up to 3 months. The pies can be reheated from frozen in a 200°C, gas mark 6, oven for 12-15 minutes.